The traps just don’t get enough respect. In fact, I’d go as far as to say that they’re the single most “underrated” muscle group for those trying to build a bigger, more muscular looking body. 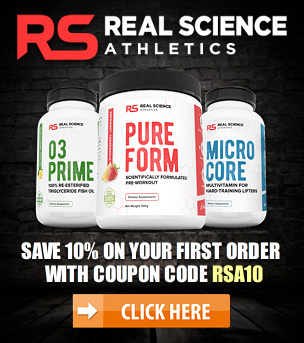 Most beginners are so pre-occupied with adding size to their chest and arms that they totally overlook the huge contribution that a well-developed set of traps will make to their overall physique. 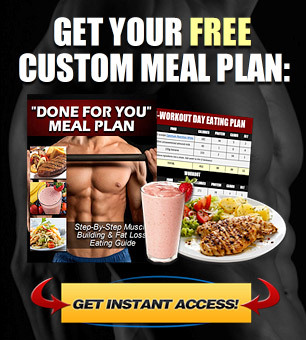 If you really want to achieve that strong and “powerful” look, packing size and thickness onto your traps is something that should be treated as a priority rather than an after-thought. There are many different exercises you can use to stimulate the traps for increased size and strength, but when it all comes down to it, a properly executed shrug is still the “go to” movement that will give you the most bang for your buck. However, the key phrase there is properly executed. Although shrugs might seem like one of the most basic exercises there is, almost everyone in the gym performs them incorrectly. In this post I’m going to explain how to do shrugs the right way in order to place maximum tension on your traps and achieve faster, more efficient growth. Mistake #1: Loading up way too much weight and using an impartial range of motion. We’ve all seen this one a million times, and maybe you’re guilty of it yourself. You might think it looks impressive to the people around you, but loading up twice as much weight as you can actually handle and then heaving the barbell or dumbbells around like a maniac while performing tiny “half reps” or “quarter reps” is nothing to brag about. Not only that, but performing your shrugs in this way does nothing to help you build up your traps more effectively. Your muscles have no idea how much weight you’re objectively lifting in the gym; the only thing they can experience and respond to is the direct amount of mechanical tension they’re placed under. Bouncing the weight up and down while using a ton of body momentum and other surrounding muscles for assistance is only increasing your chance for injury while actually placing less isolated stress on your traps in the process. 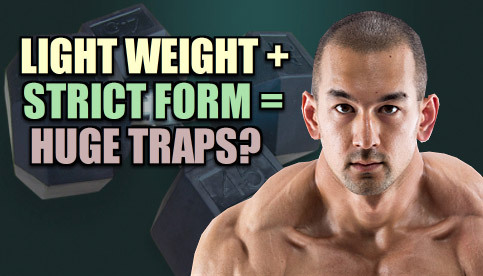 Don’t fall for the idea that “big weights equals big traps”, as it’s not necessarily the case. A much better approach to building bigger traps is to focus on using lighter weights with a full range of motion and performing your shrugs using a controlled, deliberate cadence where you can really feel your traps working on each rep.
Stop simply trying to move the weight from “point A to point B” and instead focus on finding a level of resistance that allows you to achieve the strongest contraction in your traps possible. Personally, if I perform my shrugs using the typical “explosive motion” then I can pretty easily handle 110-120 pound dumbbells for the exercise. However, it was only when I lightened up the load to around 65-75 dumbbells using stricter form that I noticed a clear improvement in my trap development. Mistake #2: Shrugging the weight in a straight up and down motion. This one won’t sound like a “mistake” to most people, since nearly everyone performs their shrugs in this way. However, the problem with shrugging your shoulders in a straight up and down line is that this particular movement actually puts the primary focus on the “levator scapulae” rather than the trapezius. 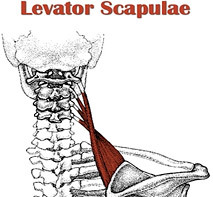 Just like the name implies, the primary function of the levator scapulae is to elevate the scapula, and this is exactly what you’re doing when performing a standard up and down barbell or dumbbell shrug. The traps will still come into play of course, but not in a way that activates them to the fullest degree. In order to move the stress off of the levator scapulae and straight onto the traps where you want it, focus on shrugging the weight at a horizontal angle so that your shoulders are being shrugged up and backward toward the mid-line of your body at the same time. Try shrugging in the standard way of moving your shoulders straight up and down and see how your traps feel. Next, try shrugging by moving your shoulders up and backward at the same time and see if you notice a difference. If you did it correctly then you should feel a much more pronounced “cramping” sensation in your traps using the modified form. 1) Grab a pair of dumbbells and hold them at a diagonal angle to your torso so that they’re neither directly out in front of your body or directly at your sides, but rather somewhere in the middle. Hold the dumbbells an inch or two outside of shoulder width. 2) Rather than standing completely upright, bend forward at the waist so that your body is angled slightly forward. Keep your neck flexed. 3) From this position, shrug the weight both up and back as far as you can until you feel a strong contraction in your traps. 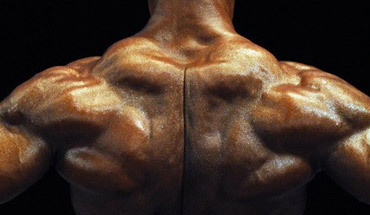 Pause briefly at the top and squeeze your traps hard, and then slowly lower the weight back down. 4) Once you get to the bottom position, allow your arms to “hang” downward toward the floor until you feel a good stretch in your traps. Hold again in this bottom stretched position for a brief second, and then repeat for a total of 8-10 reps per set. Again, the key here is control. This is not an “explosive” movement, and you really want to focus on contracting your traps at the top of each rep as hard as possible, and then allowing for a good deep stretch at the bottom. Keep in mind that this modified version of the shrug might feel a bit unnatural at first, and it does require a bit of practice in order to really nail it down. It will probably require a few trap workouts before you really get a proper feel for it, so don’t give up if it does feel a bit weird when you’re just getting started. Just keep the weights very light in the beginning and focus on technique first and foremost before gradually scaling up to heavier dumbbells. If you’re doing it properly then by the last few reps your traps should be really “fired up” and you should notice that they’re being worked quite a bit harder in comparison to traditional shrugging exercises. I also prefer to use a set of lifting straps or lifting hooks for this one, as it takes the grip completely out of the equation and lets you place 100% of your focus on overloading the traps. 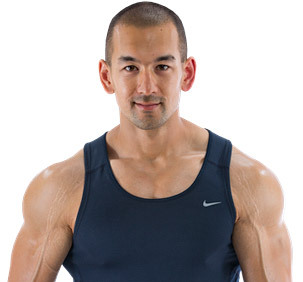 Give this modified shrug variation a try and see what you think. When done properly, I really believe this is the single best trap exercise you can do to add size and thickness to your upper back area.